임장(1568-1619)은 조선중기의 문신으로 본관은 풍천(豊川), 자는 자룡(子龍)이다. 은 17세기 전반의 전형적인 공신도상의 모습을 보여주는데, 단령을 입고 공수한 뒤 의자에 앉아 좌안7분면을 취하고 있으며 바닥에는 화려한 채전(彩氈)을 깔고 두 발은 돗자리를 깐 목제 의답(椅踏) 위에 팔자형으로 벌리고 있다. 이 초상화는 왼쪽 눈꼬리를 위로 치켜 올려 두 눈의 형상을 차이 나게 묘사한 점, 숱은 적지만 때로는 짧게 때로는 약간 길게 올의 방향을 달리하여 수염의 성질을 잘 살린 표현법 등에서 화가가 인물을 앞에 두고 실사한 느낌이 강하다. 흑단령에는 백한흉배(白鷳胸背)가 부착되어 있고 허리에 삽은대를 하고 있다. 단령의 외곽선은 검고 굵은 선으로 묘사되어 있으며 의습처리 역시 검은 선으로 선염이 전혀 없이 선묘로만 대표적인 주름선을 지시했다. '인조실록'(인조원년 9월 2일) 및 의 내용을 통해 임장이 익사공신 3등에 녹훈되었음을 알 수 있는데, 상기의 화풍과 도상을 고려할 때 익사공신 책록 시 받은 공신상으로 추정된다. 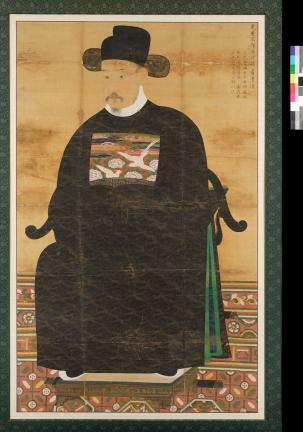 Im Jang (1568-1619) was a civil official during the mid-Joseon Dynasty. This portrait is in the typical portrait style of meritorious subjects in the early part of the 17th century. The subject is dressed in a ceremonial robe and seated on a chair, in a three-quarter view from the left, and both hands folded under long sleeves. His feet are spread wide apart on a footrest covered with a rush mat; the chair and the footrest are placed on a colorful carpet. The subject’s left eye is slanted upward higher than the right eye and the strands of his scanty moustache and beard are carefully described in differing lengths, which implies the painter worked with the subject sitting before him. The silver pheasant design on the rank badge and the silver-ornamented sash speak for the subject’s official rank. Thick black lines delineate the robe and its folds without color wash. Records about Im’s appointment as a meritorious subject are found in Injo sillok (Annals of King Injo) – entry for the second day of the ninth month in the first year of King Injo’s reign – and Royal Certificate of Meritorious Subject Issued to Seong Si-heon. These documents say he was named a third-rank meritorious subject in 1613.